If I want to move from student-grade watercolour paints to artist-grade paints, which colours should I get first? How many do I need? Well... I currently have nearly 50 colours, but I do not recommend that a beginner or someone moving from cheaper to more expensive paints does that! For a start, it's a huge investment (about £250 = €319 = US$365 = C$458 = A$480) to do that kind of thing! I'm a fan of having a limited palette and you probably need to think about what kinds of things you usually paint - someone who does seascapes might be able to justify some extra blues, someone who paints botanicals might need pinks and greens. You might also want to make some additions or substitutions on the grounds of opacity, like for example, I suggest Cadmium Yellow as your Warm Yellow, but you might prefer a transparent Warm Yellow instead/as well, in which case perhaps New Gamboge or Winsor Yellow [Hansa Yellow] would be suitable. 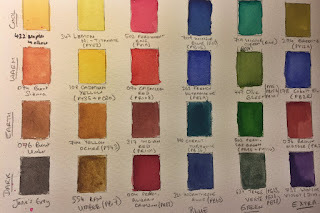 The 24 colours I currently use the most - "Jane's Grey" bottom left is 1:1 mix of French Ultramarine and Burnt Sienna - I mix them wet and dry them into my palette - it's much better than Payne's Grey. The equivalent I have included in my palettes below is Neutral Tint, as it's more convenient for the beginner. Paints essentially fall into both single-pigment and mixed-pigment paints - some of those mixed-pigment paints are what we call "convenience mixes" - ones you can just throw together yourself, but the mix saves you time - which is worth it when you're a professional who needs to fire out a certain number of paintings every day to make a living, but not for an amateur or a semi-professional, really. 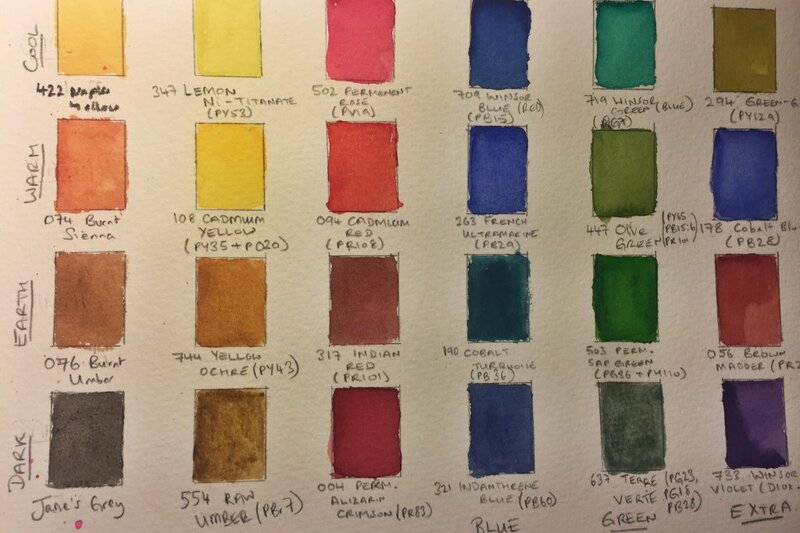 Take Sap Green - a common earthy green with a yellow undertone, used in botanical paintings - the brand I use (Winsor & Newton Professional Water Colours, 503 Permanent Sap Green) is a mixture of PY110 Isoindolinone Yellow and PG36 Phthalocyanine Green YS - so, I could save money and just mix Gamboge with Winsor [Phthalo] Green Yellow Shade, and avoid having to buy this. You can mix them when you paint with them, or, you can blend them from the tube and dry into your palette as a mixture. I'm going to recommend THREE palettes here - the Essential Palette of 8 colours (for those new to watercolour or upgrading to professional paints for the first time), the Basic Palette of 12 colours (for those with a bit more experience or who want to have a few more convenience mixes and a bit of a wider gamut) and the Complete Palette of 24 colours (which is pretty much what I use most of the time and is an adaptation of Jane Blundell's Ultimate Mixing Set based on what I use every day - so the most useful colours in my opinion. All are Winsor & Newton Professional Water Colour as they are a range I highly recommend - I have linked to Amazon UK for tubes only because buying half-pans is false economy! I can pour 2-3 half pans from a 5mL tube and yet the price of a half pan is nearly the same - so you're paying 2-3 times too much if you buy half pans! Note the sets are designed so that if you buy the Essentials Palette, all you need to do is add 4 more colours to 'upgrade' to the Basic Palette and then another 12 to get the Complete Palette nicer than having to buya whole load of new paints each time! I'm sure you can get fairly close colours in the Cotman range of student watercolours if you're a total beginner and don't want to or can't afford to take the plunge into professional colours - if so, the UK prices would be Essential, £20.00; Basic, £30.00 and Complete, £60.00 - regional price differences will apply, obviously! This is really the absolute basics - I've cut it down to just 8 colours - a cool and warm of each Yellow, Red and Blue and a couple of useful neutrals. This is where a beginner should start - it isn't cheap as it's high-quality artist's paint, but a 5mL tube of each colour could easily last 12 months or longer! 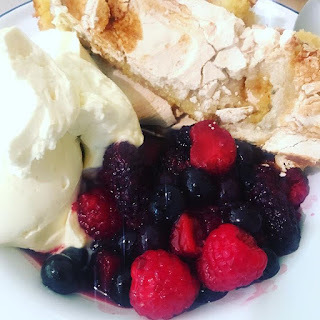 It'll seem like a big outlay - and it is - but it will last you a long time and will be a fairly easy conversion from perhaps a small student-grade mix. 12 colours that I think everyone needs and everyone can work from - I've included optional extras below that people who paint certain subjects might find useful - feel free to comment on this post if e.g. you find Cadmium Orange necessary for landscapes and I'll add it into the post as a suggestion. I split colours into Warm, Cool, Earth and Dark - this palette includes one of each of the first 3 categories for Yellow, Red, Blue and Neutrals. Darks are included in The Complete Palette, below, as are Greens and Purples. This builds on the above and comprises 24 colours that have enough convenience-mixes to make working en plein air a lot easier! As well as the Yellow, Red, Blue and Neutral groups, above, I've added Green and Purple. Each group contains 4 colours - a cool, warm, earth and dark. You could make substitutions to personal taste - like using Brown Madder instead of Indian Red or maybe Light Red as another alternative. I've used Genuine Rose Madder instead of Permanent Rose many times as I simply prefer it.